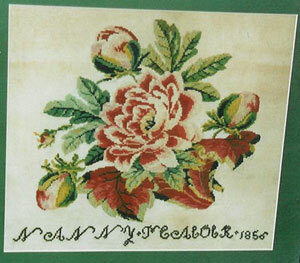 This embroidery was made by Nanny Peacock in 1856 when she was approximately 21 years of age. She was the daughter of James Peacock and Mary Birkbeck. James was a miller in Gunnerside. Nanny had an illegitimate daughter, Elizabeth, in 1857 before marrying Thomas Buxton in 1861, Seven more children were born between 1861 and 1877. The Buxton family moved to Liverpool and became cowkeepers but Nanny hated it and missed the Dale dreadfully. One of her boys, Thomas William died in Liverpool, aged 5 years in 1881 of typhoid fever and bronchitis. It is said that Nanny never recovered from this loss and she died in 1883 of chronic phthisis.